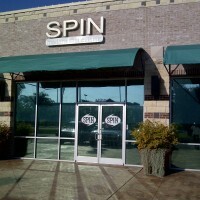 On a lazy, Texas Saturday afternoon, I was in the strip mall dominated neighborhood of US 183 and Lakeline when I happened upon SPIN Modern Thai. I thought that surely in this neighborhood, modern is a euphemism for non-authentic, bland, and Americanized. Luckily, I was wrong. I walked in to some of the best Thai food I’ve eaten in Austin. Scanning the wine menu, I ordered a glass of Riesling as well as a glass of Gruner Veltliner for my dining companion. For some strange reason, these 2 varietals with their bracing acidity, strong floral bouquet, and minerality always pair well with the sweet, sour, and spice of Thai food. Scanning the starters menu, we order the Little Wing $6, the Sweet Corn and Taro Tempura $5, and the Thai Red Snapper $12. The Little wings were 4 lightly fried chicken wings in a sweet chili vinaigrette. The frying was nicely done with little residual oil and the wing meat was tender and juicy. The sauce was a bit too sweet for me personally but was still fairly tasty. The Taro Tempura was akin to matchstick fries of taro topped with a sweet corn sauce. Again, great expert frying but the combination of two sweet dishes made the sugar a dominant flavor. The Thai Red Snapper brought the meal back into balance with little chunks of flash-cooked fresh red snapper mixed with green apple, celery and cherry tomato in a complex vinaigrette with hints of fish sauce, shrimp paste, lime juice and bird chile. This was absolutely the hit of the appetizers. Even after the snapper nuggets were gone, I still spooned bits of celery with that wonderful sauce in to my mouth. The slow burn, which follows you in this dish, along with the bracing acidity, is a bit reminiscent of leche de tigre, in which the sauce acts both as a dressing for fish as well as a palate cleanser. Having this dish with Riesling is a true pleasure. For our mains we chose the pork belly $14, and the prawns with mung bean noodles clay pot $16. The claypot dish was filled with 3 head on shrimp, soy-based sauce, braised mung bean noodles, shiitake mushrooms, yu choy, bacon, and an egg yolk which the server mixed in table-side to make a sauce. It’s a dish which evokes Spanish fideo, Cantonese clay pot rice, and Korean dolsot bibimbap. The prawn still had a nice amount of headfat and was tender. The shiitake mushrooms were clearly fresh and not reconstituted from dried shiitake. The egg yolk provided a nice over-arching richness to the whole dish. However, the bacon was overly charred and very thinly cut. It could have easily been replaced by a more authentic ingredient such as Thai sausage. Pork belly is cliche these days, yet so many places still do it wrong. Well-cooked pork belly should have a distinct fatty unctuousness that melts so quickly as to disappear in your mouth, much like the layer of fat found between the meat and the bark in only the very best of Texas barbecue brisket. Unfortunately, too many places cut away the fat on pork belly (what’s the point then, might as well use pork shoulder), or do not cook the belly slow and low, thus ending up with chewy fat. Therefore, whenever I see a new place cook pork belly, I always order it. I am pleased that I did as this pork belly dish is glorious. The belly is sous vide cooked for 24 hours, cooled, then rolled in panko bread crumbs and flash fried. It is then cut into pieces and topped with a potent panang curry sauce and served with slivered green beans. The complex and spicy curry cuts through the richness of the pork beautifully. The frying is absolutely grease-less and you have a wonderful textural contrast between the crisp panko shell in to the tender, melt-away porcine goodness inside. For what is essentially chicken fried bacon, the dish felt amazingly light leaving little trace of oil or fat on the tongue. Some true cooking chops went in to this dish. We ended with a shared dessert of the coconut panna cotta $5. The panna cotta was delightfully soft and not hard-set like so many panna cottas and had a fresh taste of coconut, while toasted, salted almonds, chili, ginger syrup, and kaffir lime leaf provided a nice savory counterpoint to the sweetness. A very inventive dessert, that on the surface appears simple. On this Saturday, there were 2 other tables occupied and not one person at the bar. I’m not sure if SPIN Modern Thai is too exotic for the suburban neighborhood it is housed in, but I am hoping that they survive and thrive as there is some real talent in the kitchen. editor’s note: This post was penned by Shawn Li, one of the top food writers in Austin. Over on the nearly dormant Chowhound board, Li writes under the name Lix Lix. I recruited Shawn over the course of a year or so before he agreed to come on board the Chowpapi project. No easy affair. It was only after flying him out to Vail for a long weekend on the slopes at Vail Mountain Lodge and Spa that he finally signed a long-term, high dollar contract to provide occasional articles for this site. This entry was posted in Austin Texas and tagged Austin, austin texas, austin Thai restaurants, lakeline, northwest austin, spin modern thai, texas, us 183. Bookmark the permalink. Thanks for the article. It was honest and well written. I’m glad you enjoy the food.